Description: Mantra 2 is a advanced flipper designed by Eric Glesser. 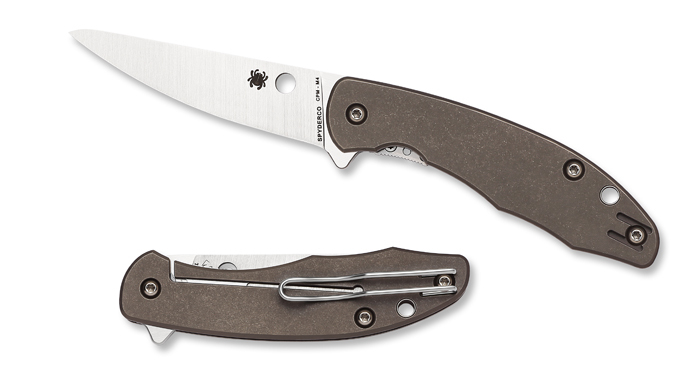 It features Titanium handles and Reeve integral lock, with a seriously cool CPM M4 blade. The knife cannot be opened by Spydie hole, only flipper! A portion of sales of this knife are donated to The National Parkinson Foundation. This entry was posted on Tuesday, March 29th, 2016 at 10:45 pm	and is filed under 3" to 4" Knives, Designer - Eric Glesser, Features - Flipper, Features - Screw Construction, Handles - Titanium, Lock - Frame Lock, Lock - Reeve Integral Lock R.I.L., Manufactured - Taiwan, Steel - CPM M-4, Type - Folding Knife. You can follow any responses to this entry through the RSS 2.0 feed. You can leave a response, or trackback from your own site.